You've just spilled a glass of wine on your living room sofa—what do you do now? It's important to act promptly but not to panic. 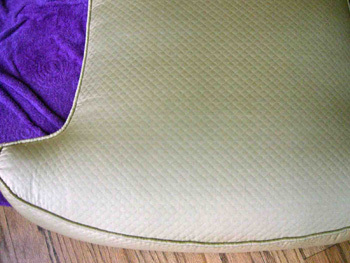 Follow these upholstery cleaning guidelines to control a spill and prevent a stain. Blot lightly with a dry white paper towel to start. Increase pressure and use a fresh paper towel until no more liquid is absorbed. DO NOT RUB! If residue remains, see the stain removal guide below. I recommend using 1/4 white vinegar to 3/4 water as a water based cleaning agent. It is a natural cleaner that doesn't leave a residue. · Always test water or a cleaning agent by applying to the same upholstery fabric on a hidden area of the upholstered piece. · Allow the test area to dry completely, then check its effect on the fabric. Apply water or a cleaning agent (as recommended in the stain removal guide) in small doses to avoid spreading the stain or causing a ring. Be patient; apply several times, blotting firmly with a dry paper towel to soak up the liquid after each application. · Never rub a fabric; rubbing could result in damage to the nap, loss of color, or spreading of the stain. · Restore the nap on velvet by brushing gently before it dries. · To avoid water spotting, use a fan or cool blow dryer (on a cool setting) to accelerate drying. Dry from the outer edge of the affected area toward the center. 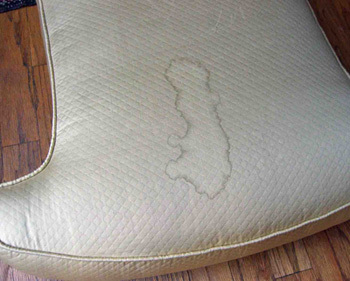 · If the stain persists, seek professional upholstery cleaning assistance.